Will the real Zlatan Ibrahimovic please stand up? That word was on repeat in my head as I watched Zlatan Ibrahimovic’s spectacular bicycle kick sail past Joe Hart on Wednesday. 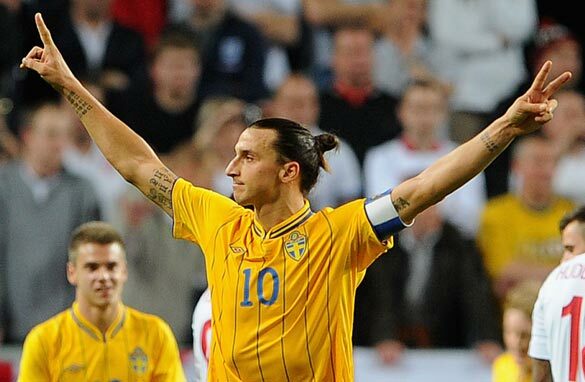 That goal against England in Stockholm epitomized everything the Swedish striker stands for. It was audacious, outrageous and even a bit cheeky to boot. I won’t enter into debate on whether it was the best goal of all time, because I definitely don’t think it was, what I will discuss is Zlatan’s standing in the game and his legacy. I will admit when I have watched the striker in person, I have often become infuriated with his lack of commitment and work ethic. Sometimes it seems as if he quite simply does not care. He walks around, and stands around, a lot. Detractors also point to his less than spectacular goal-scoring record in the Champions League. He has scored 33 goals in 99 games, a rate of one in three, a lot worse than he has done in league play for his various clubs and for his country. So who is the real Zlatan? Is it the guy who comes up with incredible goals every once in a while but struggles to produce the goods on the big occasions? Or is he simply a misunderstood genius? The truth may be somewhere in the middle but, if forced to fall down on one side of the fence, I would go for the latter. You can criticize him all you want, but his silverware haul has been amazing throughout his career. This guy has won titles in Sweden, Holland, Italy (with three clubs, thought his two Serie A triumphs with Juventus were later revoked) and Spain. And he is well on his way to adding the French league title with Paris Saint-Germain. I say, when it comes to Ibrahimovic, you know you have to take the good with the bad. He is one of those special players you have to make concessions for, much like Diego Maradona, Romario or Hristo Stoichkov. Don’t expect him to defend and don’t expect him to think of the team ahead of himself, one reason why I don’t think he would ever succeed in England. Fans just wouldn’t understand him. They would want to see some huffing and puffing, and those words just don’t mix with “Ibracadabra”. So where does he rank on the list of world’s top footballers? It’s a tough question, but if you take the best of Zlatan, he is definitely in the top five, maybe even in the top three. His skill on the ball is second to none and he consistently scores goals out of nothing. What do you think? If there is one certainty about Ibrahimovic, it is that his legacy will forever be tainted by his attitude. Long after he retires people will still be talking about how good he really could have been if he tried harder. But then again, that just wouldn’t be Zlatan, would it? Splinters in your a***? Just how uncomfortable is that fence, you're sitting on? Ibrahimovic is dead beat loser, his ego gets the best of him. Why didn't he truimph with Fc Barcelona?? Of course he care – have a look at his physics. He is probably the best trained footballer in the world. Do you believe that has come out of not caring? Not working hard? Further for a forward it can be a deceiving trick to look uninterested then suddenly explode in action. Look at the big cats there are similarities. This change of tempo caracterise the really big players from the rest of the field. Barcelona can do that several players together increasing the tempo. Maybe on the very top level Zlatan is the only one who can do it on his own!
' They would want to see some huffing and puffing ' what the *%*$ are you on about ? 'They would want to see some huffing and puffing ' eh ? Zlatan is very working very hard throughout the games, any one that says differently doesn't know anything about football. He often even throws up after games – exhausted, according to Milan his physical condition was outstadning. He was the top scorer in Italy last year, scored the most goals in the french league so far. So what is Pinto talking about? Pedro, you describe the old Zlatan. His attitude has improved for every year in his lateer career. Before he retires in 3-4 years time he will have accomplished great things. He is on a roll right now. Then England should hate Rooney. In Kiev against Italy I have never seen someone do less. They Brits seem to understand his lack of huff and puff just fine. You are complety wrong about about your last senteced. He always try to improve himself and be a even better player. You don´t know nothing about him and what kind of person he´s really is. I couldn't agree more with you Pinto, it's a pitty that players like Zlatan and Christiano Ronaldo will be remembered in such a way. What??? His ball skills "are second to none"?!?!? Is this guy being paid by PSG or Zlatan or is he simply not observant? What about Messi and CR7? Or Xavi, Neymar or Inesta, all of whom have some of the best ball control skills ever seen on a football pitch. And I know that list is short, there are tons more that have just as good, if not better, skills than Zlatan AND they dont come with all his other garbage. And as for consistently scoring goals, really? 33 goals in 99 matches is consistently? Not by a long shot. Sure the guy is good, really good, but one of the best 3 in the world? No. For sure top 10, but not top 3. I realy don't think that the that Zatan you desplay in the articel reflect Ibrahimovich of today fairly. Ones he was an underachiving selfich supertalent but the guy has matured massivly sens then. He has developt into a true leaderfigure both for Psg and Sweden. the whole combination of massive power, scoring instinct, technique and attitude is what I think makes Zlatan unique. Top3 in the world? In my mind only Messi himself is on a higher level of Play. I wonder until now what the heck Ibra said to Guardiola once they got the champions league for Barza just when the coach was crying emotionally? It feels that that was not something nice based in Guadiola´s reaction. I have never liked “Ibra”, I have always found him overrated and that he got all that publicity from the media because he had a sob story in his backpocket. Like the English TV commentators said, Zlatan Ibrahimovic divides the Swedish people in half. He had really done it for me when he stole a penalty from another player in a match against San Marina in Gothenburg, Sweden leading the game with five or six nill at the time. I Thought that he should be thrown out of the team right there and then. Zlatan Ibrahimovic has until now never performed against a English team or in the national team. I still don't like the man, but i got to admit he put on a sparkling magic show against a weak England.He single handedly won the game, Sweden would have lost without him. And like the English TV man said, its like some Playstation thing. To get down to business, Zlatan Ibrahimovic i forgive you. Well, Mr. Pinto, you're right. He is not a team player, never was and never will be. He doesn't run with the pack. This is not by choice, it's by nature. I was there and watch that one man show, and as others have pointed out before you, the naming of cats is a difficult matter. And while we know his particular, peculiar and more dignified name of Zlatan, there's still one name that we'll never will guess. Yes, that one, the one that the cat himself knows and will never confess. And that's something we pack people just have to live with. 1. It occurred in a friendly...Do you think that Joe Hart would have played the ball off his head in the same manner he did if the match actually counted? 2. It occurred when Sweden was already ahead and winning...if Sweden had been behind, or tied, he would not have taken the same chance. 2. It would have to be a great individual (or team) effort. 3. The goal would have to mean something to the result i.e. not just running up the score. Did Zlatan score the greatest goal ever? Probably. Was it the most spectacular? Yes. But if he happened to be Portuguese it would be a different story. Tried harder? No footballer works harder than Ibra. Remember when he went to AC Milan he shattered the clubs fitness tests. No one trains harder. He never goes out drinking. He's either in practice or spending time with his family. He's a very agressive player and plays with a lot of emotion, it's just his style, that doesn't mean he has a bad attitude or doesn't work for the team. He won every title every season the last 10 years. Everywhere he goes he brings titles to his team. He walks around a lot because he's big, he can't run around all of the time like Messi. He saves his energy so he can explode in a counter attack. I don't know why people focus solely on his goal scoring prowess or lack thereof at times. What I do know watching him play at AC Milan and at PSG the past few seasons is that he distributes the ball very well and gets lots of assists. Just the other day I was watching PSG in a match against another Ligue 1 team whose name escapes me and Ibra set up at least 2 and possibly 3 of the goals the team scored but did not score himself. His passes were perfectly weighted and timed for the eventual goal scorer. It was beautiful, selfless team play. So let's not forget that aspect of his game when evaluating Ibra, the man/player. A good goal is a good goal. It's importance is a different issue. Example. Remember Andea Brehm's Penalty that won the world cup in 1990. Would you rate it among the best goals of all time? It surely can's get that more important in Soccer. Soccer lovers will always remember the best goal they ever saw, be on a training ground. That is why we have youtube to share some of those un televised momemnts of genius. I believe that he'd have tried that same stunt in a world cup final with Sweden down by a goal. He knew exactly what he wanted to achieve with that audacious scissor kick. Ibrahimovic is an outstanding footballer with immense self belief. He revels in having the audacity to try things other footballers will be too scared to try. That amazing goal is a personification of his personality; bold, audacious, deep-seated self belief, supreme confidence, immense talent!!!!!!! Ibra's goal had everything it takes to be the best goal ever. The speed of thought, the inventiveness, the execution were all other worldly. Never mind that it was in a friendly (Joe Hart was not intentionally sloppy with his attempted clearance, as has been suggested. It was a full international for goodness sake, and anyone who's played the game or even watched it a lot will know that a competitor is a competitor whether it's a World Cup Final or a training ground kickabout, so show Hart some respect! Ibra's problem, as with Cristiano Ronaldo, is that he is not liked, therefore people are reluctant to bestow greatness on his shoulders. Had Messi done that we would have been celebrating his jaw-dropping genius and the greatest goal of all-time. That's because he's humble, inoffensive, and has something youthful and innocent about him. With Ibra there's always a "Yeah, but, and any acknowledgment of his talent is grudging because he's brash, arrogant and outspoken. All of these things are true, but in pure football terms he is easily Messi's equal. Sure, his impact on games may be different from Leo or CR7's but it's just as decisive in its own way. Of course there are thngs he doesn't do, but the same could be said of all great players. It's a team game, not everyone will be good at everything. So,in short, given the role he's carved out for himself and judging him purely as a footballer, he is certainly among the all-time greats, and as for that goal, well Roy Hodgson and Steven Gerrard each said they can't recall a better one, and that will do for me. Zlatan is an amazing player, with enormous physical strength and quite unique technical skills. True, he has always had an attitude, but that is precisely what makes him a winner too. Besides, his game has constantly progressed and since a couple of years he has become a real team player. Zlatan has proven once again against England that he is absolute top. Lets not go over the top he scored against a very young and inexperienced England team that had many newly capped players, it was only when Steven Gerrard went off and more young lads came on he did his damage. I agree that Zlatan is a great player, perhaps the greatest of all time in Sweden, but he has never won any titles back home in Malmo FF, nor in any other Swedish team. It is ironic that Ibra is accused of being lazy when the goal under discussion was scored as a result of him chasing what seemed to be a lost cause. He forced the keeper to come out of the area and attempt a header. He then turned and intercepted the pass thin a moment of magic and bicycle-kicked the ball goalward without looking where the goal posts were. Plonk at the game again and you will realize that he laid perfectly waited assists from which his two team-mates should have scored but did not. So much for selfish play! Exceptionality is what makes individuals special. People like Zlatan can turn the fortune of a team around even when the whole pack isnt doing well. It is difficult to neutralise him in a game. I think he is special and lethal when his team is doing well. Ridiculous discussion and this guy Pinto knows less about football than I know about horseback riding. 1. There is NO way to tell which goal is the greatest of all time. This was a real stunner, a beaut, a piece of genius signed by a still living football legend. Almost no one else would have tried (or even think about) it and if somebody else did he or she would probably not even had hit the ball. That's enough for me. This is "world, world class", as Stan Collymore put it. 2. Ibrahimovic have matured so much during the last couple of years. Anyone that says he is not a team player disqualifies him- or herself from the discussion. Sir/Madame, with all due respect: you don't know what you're talking about. He works hard in almost every game. Sometimes he does stuff that I really don't like. For example I wish he would run to a scoring teammate more often, seem more happy about it. Still I think he really, really is. I don't think he acts this way because he doesn't love his team, but because he puts so much pressure on himself. And if the goal is scored, and the job is done, maybe these are the only moments where he can relax for a little while and not be the center of attention? I don't know, I'm just speculating. 3. Is Zlatan one of the top three players of all time? Or is he one of the top ten players of all time? Who cares! It's almost exactly the same thing. Messi may be outstanding, but he is also always in surroundings few football players can dream of. Zlatan has proved – over and over again – that he can take any team and make them into champions. Messi never did. Maybe he could, but I don't know this. He never proved himself in that aspect. All he ever proved is that he can be the best player in the world in the best environment in the world. Maybe his soft-spoken attitude wouldn't make a good team into a winning team? Maybe Zlatan's persona is the difference? Zlatan may be the biggest of them all, the way he leads every team he plays for to championships. 4. Zlatan's issue is that he plays for Sweden. If he played for Argentine I think they would have won a whole lot the last couple of years. But even though (for example) Messi – and I really like Messi, I don't want to diminish anything that he has done – plays for Argentine, one of the top three nations in the world, what have they won? Last time they won the WC: 1986. Last time they won the FIFA CC: 1992. Last time they won the Copa América: 1993. Last time they won the Pan American Games: 2003. They won the Olympics in 2008 and Messi was one of the reasons, so there's a big title. 5. I would like to see Zlatan take a team to the top of the Champions League. I think that would once and for all prove that he is one of the greatest of all time. Football is not only about how good you are on the ball but also about if you can make a team a winning one. What is all talk about that Ibra dont try hard enaugh? He works very hard for his team both Swedish national team and his club team!! He has grown into a great Captain for Sweden and is encouraging and inspiring his teammates.. Anyone who say he is not a team player must have been watching him on youtube!! He is, if you watch a game live, both being a defender when needed and are doing a lot of assists to his team mates...Now I don't care much for this compare with Messi...They are two great players...but two very different players, we can just look at the physic of the two and get the clue.. Ibra is 31 yo, but is still developing his skills and setting goals to be better.. Enjoy this guy while you can, cause he is an amazing player with a huge personality!! He´s the only player in the history of fotball to become top scorer 3 times in seria A with 3 different clubs. He set a new club record and became the first player ever to score in his 4 first games (7 goals in 7 games). 46 Games, 22 Goals and 13 assists, this while beeing injured large parts of the season. 0,76 points per game. 14 Games, 12 Goals and 5 assists 1.21 poists per game. Ibrahimovic needs to go back to his roots and play for Croatia or Bosnia. Zlatan Ibrahimovic is growing in stature all the time. Scores awesome goals and makes decisive passes to better placed colleagues. Opponents find it difficult to read or predict what Ibra will do next. Same is not the case with other superstars from Europe and Latin America. Good for club and country fans and not so for rivals. Zlatan is TOP THREE in the WORLD and I'll tell you why. He's won everywhere he's been but Barca. And why not there? Because play does not go thru a traditional Number 9 at Barca. EVERYTHING goes thru Messi. EVERYTHING. Second, NO ONE in soccer can chest a ball down exactly where he wants it and create a shot off it like Ibra. NO ONE. And he's 6'5"!! For a player of his height to be as graceful as a ballerina is amazing. He also makes others around him better. He CARRIED Milan last year. No Ibra? Milan would've finished 20 points in back of Juventus last year. Guys like Nocerino and Silva became better players because of Ibra, as well as inspiring the likes of current Serie A MVP El Shaawary. How's Milan looking now? He's won domestic titles everywhere and is usually marked by the other team's top defender. Yet, he scores 30 a year. Messi and Ronaldo have ALL-STAR teams around THEM, but even with PSG's big spending who has CARRIED the team so far this season? Yep.. Ibracadabra. People who hate Ibra will always hate him. But when you talk about the Top This or Top That in soccer for the past 10 years, Ibra is Top Three in any knowledable fan's view. He's a winner. Period. Not to mention he scores over 70% of Sweden's goals. Does Messi for Argentina? Does Ronaldo for Portugal? Not even close. I'll take Ibra on my team any day. I miss having him as a Juventino. But I can still appreciate him and adore watching him play. We as fans are lucky to witness his magic!! You are in the wrong regarding Zlatan dividing the Swedish people in half. He is actually loved by the vast majority of the people – I would say 95% love him and his rambunctious personality. I live in Sweden and even some of my non-football interested friends turn to watch football games (even PSG games!) just because Zlatan is playing. I am happy to hear though that you have forgiven him for whatever it was and welcome you to us 95% zlatanistas. As i was told to stand up , i am standing up lollllllll. On a serious note i think i am the worlds most talented striker, i am not harworking and i behave like a king sometimes,i admit i may be swtiched off sometimes and i also admit i rarely chase balls i loose on the pitch but one thing is for sure " what i can do nobody else can do"
You clearly would have needed to do some research before writing this article. The reason to why he sometimes look like he is "slacking" is because he "saves himself" for the moments when he truly is needed. As he had said in interviews and in his book, he weights around 100 kilos, therefore he explain that he would not be able to run around and work his as off like some other players. He belives that it is better to have all the energy and focus when the "right moment appears". I think that it was Van basten?, that tipsed Zlatan of this "tactic". Kudos to Boateng for what he did. And the only best way to stop that, is for the players to keep walking out. Or the associations to start deducting points of that particular game from the home teams and award it to the visiting teams who were subjected to racial abuse, in both championship/cup games.